LISBON — Two Cleveland men indicted as a part of the Operation Big Oak made appearances on Friday afternoon in Columbiana County Common Pleas Court. An arraignment was held before Judge Megan Bickerton for Anthony Jackson, 31, Cleveland, is one of the Jackson relatives believed to have led the Down the Way street gang, the group believed responsible for bringing 1.4 million doses of cocaine, heroin and fentanyl into Columbiana County. 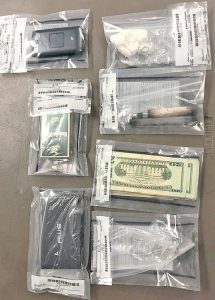 Jackson, who is also known as both Rob and Tone, is facing charges of engaging in a pattern of corrupt activity, participating in a criminal gang, three counts of aggravated trafficking in drugs, three counts of trafficking in heroin, and one count each of trafficking in cocaine, aggravated possession of drugs and tampering with evidence. Some of the charges also contained a forfeiture specification, which claimed Jackson had $614 in his possession believed used in the commission of a felony drug offenses. Despite the request of defense attorney Jennifer Gorby for modification, Jackson’s bond remains at $500,000 cash or surety. Also appearing before Bickerton Friday afternoon was Antonio Fleming, also known as Ya-O, 33, Cleveland. Fleming is charged with engaging in a pattern of corrupt activity, two counts of aggravated trafficking in drugs, two counts of trafficking in cocaine and an aggravated possession of drugs in connection to the Operation Big Oak indictment. Additionally, Fleming also is facing charges of aggravated robbery and felonious assault for his alleged involvement in the beating and robbing Joshua Peterson of his commissary money at the county jail on April 17. Gorby asked to withdraw as council for Fleming after she said it has become apparent she also represents a person listed on witness list for the case aggravated robbery, a person she believes may be called to testify against Fleming. Bickerton said she also needs to transfer the case out of her courtroom because she was involved in the case against Fleming’s co-defendants in the aggravated robbery case in her former role as assistant county prosecutor. Bickerton said she would ask fellow Common Pleas Court Judge Scott Washam if the case could be moved to his docket and they would contact some attorneys outside the Criminal Defense League, because it appears all the defense attorneys in that organization have defended a co-defendant in the case. Jackson was appointed defense attorney Kelly Linger and a pretrial was scheduled for Feb. 11. Fleming had been scheduled for a jury trials in his two cases on Jan. 23 and Jan. 30. Both jury trials have been canceled until a new attorney can be found. Operation Big Oak was a 757-count indictment, which included charges for about 100 defendants.